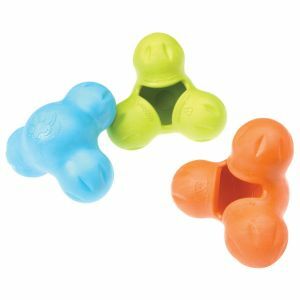 The GoughNuts Ball while not designed as a chew toy, is still made of the same GoughNut rubber, making it an ideal interactive toy for even the most aggressive dogs. The GoughNuts Ball is no doubt tough with carbon technology to enhance strength. It's guaranteed for life as is all GoughNuts toys. Sizing is the most important factor when it comes to safety and therefore be sure the ball is large enough for your dog (the ball is 3 inches in diameter). *NEW* Pro Series. The Pro Series is a High Modulus, Which means it's 50 Hardness (10 points higher than our original GoughNuts Black recipe).Pro Series Goughnuts do not Float. 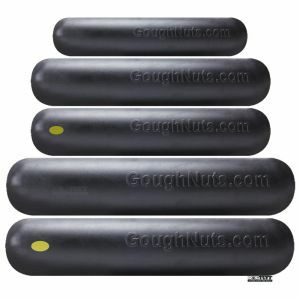 The GoughNuts Ball Black is tough, It's stronger and more durable than the Original Green. The GoughNuts Black Ball incorporates the original GoughNuts Green but then adds carbon technology to enhance strength. The GoughNuts Ball Black is guaranteed as is all GoughNuts line of chew toys. 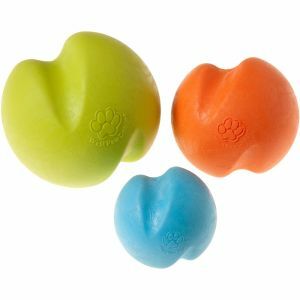 The GoughNuts Ball is designed with a multi-axis groove system that may help your dog breathe in an emergency situation of throat Blockage. Spherical objects or balls can be a safety hazard for the reason of throat blockage. Therefore, it is important to know that the GoughNuts Ball is NOT a chew toy but an interactive toy. 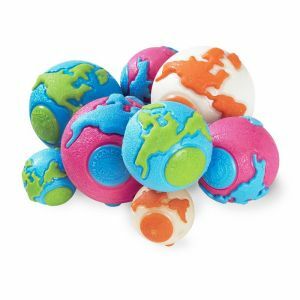 If your dog is left to chew it will attack the grooves, and if you have a power chewer, it will destroy GoughNuts Ball. The Pro Series is a High Modulus, Which means it's 50 Hardness (10 points higher than our original GoughNuts Black recipe).Pro Series Goughnuts do not Float. They also have less of a bounce when compared to the Original Black Ball.